Let us now discuss how to convert a percent into a decimal. Let’s write a percent as a decimal. We now know that which we can further reduced to . Since we want to convert it to decimals, please understand that . So if we divide 3 by 20 we will come up with the decimal equivalent of . So let’s do and the answer is . If you look at it, is the same as . There’s a proper way to read . It is read as ‘fifteen hundredths’. What do hundredths mean? This is the tenths spot and this is the hundredths spot. Right off the bat, we can write . Another one is . It has to end in the hundredths spot. It is . 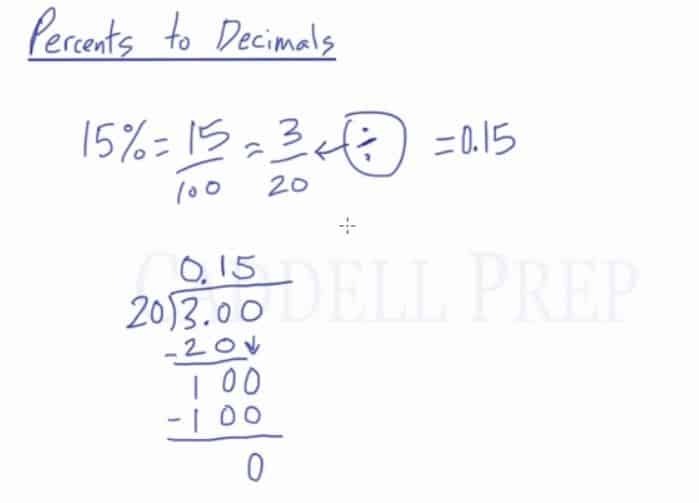 So a quick way to convert percent to decimal is to move two decimal spaces from right to left.